It has been a little while since I last blogged here announcing Annie’s birth. The reason for this is that, while blogging can be a great way for me to express my feelings, it has also become much harder after Maddie passed. When Maddie was alive I could easily blog three or four times a week about life with that amazing little girl. These days, however, getting my feelings out and on the page is difficult. All too often they are a jumbled mess inside my head, and it is impossible to sort them out let alone blog about them. Other times the “guy” in me won’t let me express how desperately I miss my little girl or how deeply wounded I am. On those days I just try to make it through while doing my impression of a regular person, whatever that is. I bring all this up because I was thinking today just how amazing Heather has been with her blog. Starting with a post discussing her apprehension about speaking at Maddie’s memorial service, Heather has blogged five days a week non-stop following Maddie’s passing. She has documented her feelings even on days that were unfathomably hard. One involved bringing Maddie home in an urn, another involved living through what would have been our daughter’s second birthday. Other days were even bleaker. Days where it seemed like this horrible experience might finally break us. Still…Heather blogged. What is left behind is truly an amazing document, one that details just what it is to live through something like this. It has done a lot of good too – not just for Heather, but for readers who have gone through – or are going through – something similar. The communal healing and sharing of grief has been wonderful, and it is the kind of thing I wish critics of social media were more aware of. Heather isn’t the first person to blog through grief. She was inspired to write about our loss by Tanis from The Redneck Mommy, who was one of the original grief bloggers. Tanis writes about her son and her feelings in a truly meaningful way – she has brought Heather and me the kind of comfort that I hope Heather’s blog can continue to give to others. I am so, so proud of Heather. I am biased, of course, but to me there is no better example of what it is to blog through grief. The “guy” in me may not like it, but I hope to become more like her as we continue down this terrible road. Heather and Heather’s blog are amazing. I am also blogging through grief (we lost our first born baby girl in 2008, five days past her due date) but I don’t update nearly as often as she does, mostly for many of the reasons you listed, even though I am clearly not the man! I find a lot of what I have to say about my grief these days gets repetitive. Because what is left to say? I love her. I miss her. I want her back. Of course there is much, much more to it than that, especially with the arrival of our second child, just a few months before you and Heather welcomed sweet Annabel, but that is essentially the crux of it. I guess it is for you, too. Nice to hear your voice again, Mike. I have been so grateful for Heather’s blogging through grief. 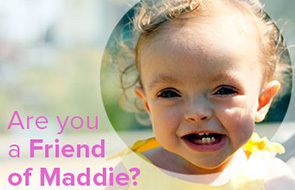 When Maddie passed, I was watching my closest friends lose their son. He suffered from a fatal genetic condition called Spinal Muscular Atrophy and we knew he would not live, likely not past his first birthday. We lost him in August, two days before that first birthday. I say all of that to say, Heather’s willingness to blog through her grief helped me to know what we could expect, even if that meant NOT knowing what to expect. It gave me some insight into how to help Ollie’s parents and also what to expect in my own grief. She is doing an amazing thing. Even now, she is still helping us. Our friends are expecting twins in August. It is so good to continue to read how wonderful AND complicated this will be. Thank you, Mike, for this post and reminding me how important it is, what you and she are doing. Awww, this is so sweet and beautiful. Heather is amazing and every day that I read her blog I’m amazed by the strength she shows to put something up on it. I wonder how many people could do the same thing. I hope you keep blogging as well. It is nice hear how you are doing in your own words. Heather’s blogging has helped others in the same situation and those of us that hope to never experience what you both have. Her post about “What to say” helped me profusely a few weeks ago as I watched as a friend lost her daughter to cancer. Ya’lls strength is amazing and I have no doubt that you will blog more frequently again when you are ready! I’ll be in LA in a few weeks, can’t wait to see ya’ll!! Heather rocks -and so do you – love you guys! This post is an amazing tribute to your amazing wife. She owes the world nothing, and yet, every day, she shares pieces of her soul with us. Posts that make you weep as your heart breaks into a million tiny pieces. Posts that make you laugh so hard your side hurts. It’s real. It’s not forced or contrived. It’s not dramatized or prettied up. Heather and Tanis are truly THE examples of blogging through grief. .-= Brittany´s last blog ..Heaven hates teabaggers. Which, fyi, is totally a real word, spellcheck. =-. You are sweet Mike. But what you neglected to post about is how strong you are too. If it weren’t for the support of you and men like Boo, neither Heather nor I would have been able to muster the courage to keep walking forward. Don’t dismiss the support you have provided Heather with. It takes a big man to keep loving a broken woman and work towards a new normal. You help keep our worlds upright when we are upside down and lost in our oceans of grief. Don’t forget that. .-= Redneck Mommy´s last blog ..Until Further Notice =-. I love what both of you have done for people. Even for myself sometimes just to be reminded that my daughters life is precious and I need to really cherish every moment! .-= Danielle´s last blog ..The Happiness Project Week 4 =-. Just as people (including myself) thank Heather for sharing her feelings and Maddie and Annie and, really, herself with the world, we all need to thank you for supporting her as she does that. Even though you may not blog as often, you are present in every post over at Heather’s. .-= Alison´s last blog ..A List, Because I’m Lazy and on Spring Break =-. Heather is amazing and it sounds like she has a pretty amazing husband too. You, Heather, Maddie & Annie are in my thoughts everyday. Hugs. Redneck Mommy said it VERY well…you have been a strength for Heather and she amazes me daily with what she is able to express, but know YOU haven’t been forgotten out in the blog-o-sphere. I know the joy Maddie brought to your daily life. Your posts oozed with admiration for your daughter…which is why I came and visited you every day…to see what you and Maddie had been up to. There was always such a joy about your posts. I know that nothing I could say could make these times any easier, but please know I think of you and Heather daily. I just want to say that I was the one unable to blog when I was lying as still as I could to keep the baby safe inside me for three months. I couldn’t even answer the phone or return email. It was my beloved, Todd, who blogged everything. There’s something special in people who can articulate themselves while immersed in grief. I can only hope to someday have the kind of love you and Heather have for each other. To know the love you have for your daughters. The four of you are amzaing in every way. Rigby too, of course! Albeit a tad more hairy. Beautiful words, such a wonderful tribute to Heather, to write in awe of her, even when writing is the hardest thing for you to do. Through Heather’s words she shares so much, she is open in such a way that only a person who is truly loved can be… No hidden agenda – just open to the world. Hold on to your girls Mike, all three of them, they need you. She is lucky to have you – you are lucky to have each other. I’m in awe of you both. What a wonderful man, husband to Heather, and daddy to Maddie & Annie, you are Mike! You & Heather, both, are amazing people, as well as amazing, loving, parents. Thank you so very much for letting us inside the very private corners of your heart. MADDIE IS SO PROUD OF YOU BOTH……………. Mike…..what a wonderful job you did on this post. You’re right! Heather has done an amazing job with her hurt & thoughts. So often I get lost in both of your thoughts and before I know it….I am sobbing. I often wish I was a closer friend to you so I could offer you more support, more love, more friendship. I wish in my hearts of hearts I would have had the honour of meeting, playing, hugging, loving Madeline. I KNOW I would have love her….I know this to be true b/c I feel b/c of you and Heather…I DO know Maddie and I Love her very much too. The love between you and Heather is obvious and beautiful. Grief is a horrible thing…it’s a crap shot….for some couples, it brings them closer together. In others…it tears them apart. I am proud of both of you and no what happens in My life, I will tell you this for sure….you have my suppport, my friendship and Maddie will ALWAYS have a very special place in my heart and I will never ever forget her. Keep up the great work and thank you for the messages you have given me….I appreciate very single one of them. Just wanted to say that I’ve been blog stalking you and Heather for quite some time now, and that I’m sending positive thoughts and prayers to you both. I have no idea how you both are truly feeling as I’ve not had to experience anything like you have, but from what I read, you are BOTH dealing with things in your own way and I think that’s the best thing you can do. Maddie is obviously never going to be forgotten, and Annabel is the cutest little baby girl, she is so lucky to have you guys as parents. God Bless you and your family…hope you receive these positive thoughts I’m sending from lil’ ol’ Kansas. I remember once writing something to you about being strong for each other. That was really a pretty crappy thing to say to you – I’m embarrassed that I ever said it. I should have known that the words didn’t need to be spoken and I’ve felt guilty about them – so guilty – since you wrote of people saying it and how you felt. I write this to say that YOU have done amazing things – and your voice, even if it’s not always heard from, is always in the background of Heather’s posts. I’ve always hoped for the best for you Mike – and I always will. .-= Amanda´s last blog ..Because Clearly I Am Losing My Mind =-. I honestly don’t know what to say. I’m blown away by the strength and raw emotion that both you and your wife have shown us. Thank you to both of you for letting us into your lives no matter how much you want to completely shut off from everything outside. .-= Amanda´s last blog ..I’m pretty sure my husband is gay and may be breaking up with me. =-. I’d go further: I think we’re changing the face of grief, those of us who talk about it. The critics of social media are bozos. They don’t know what it’s like to have no other friends left other than the ones online, like my Facebook friends. You two inspire me. Each, in your own unique way. .-= Supa Dupa Fresh´s last blog ..Et in Arcadia, Ego. =-. You guys are doing great. You are both amazing role models for anybody going through something like this. I hope you will keep blogging too. I found Heather’s blog (and through hers, yours) while reading the L.A. Times online just after Maddie passed. There was a link to her blog with the story. I had no idea then that I’d still be reading now, but both of your blogs have touched me very deeply and so here I am. And incidentally, I don’t even have kids. Heather’s and your sharing of your own experience has helped me in unexpected ways, unexpected because our situations are so different. I, like so many others, will always read what you guys write, will always care about your family and will always remember Maddie, although I never met her. Mike, I have read your blog a few times and know how you have written some beautiful music to express your feelings for Annabel and Maddie. I read another blog called A Daily Scoop about a mother who writes about the loss of her daughter, Camille, who was about 20 months old from a drowning accident. There is a post on A Daily Scoop on July 29 2008 where one of her friends had written a song for her expressing her sadness, grief but also hope. I think the lyrics are amazing, and I hope you get a chance to listen to it some day. Maddie was such a beautiful baby and I am so sorry for your loss. I am so sorry for your loss and I know that doesn’t lessen the pain, but I am! I think of you all everyday and night and I pray that you feel all of the thoughts, and prayers around the WORLD in honor of Maddie. Even though she isn’t with us she has made a HUGE impact on way to many lives to count! THinking of you all and wishing you fun and good memories today! .-= MBKimmy´s last blog ..Helping me find God =-. Amen to that. I have not suffered anything like this kind of grief but I love reading Heather’s writing because it’s so moving and inspiring. She helps me appreciate life and treasure every moment with my son. I know she has affected so many people this way. I take lots of pictures of my son and I give him extra kisses and turn my attention back to him in those little moments when I start to wander off mentally, all because of you guys and Maddie.